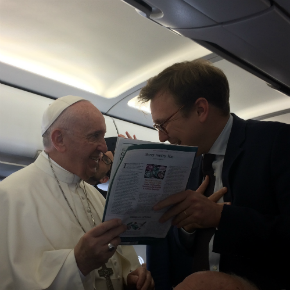 Pope Francis received some specially delivered in-flight reading when on board his plane flying to Cairo last Friday. 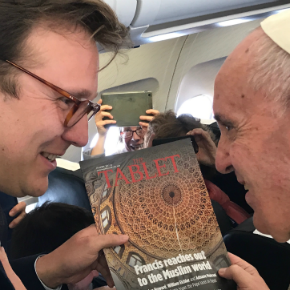 The latest edition of The Tablet was personally handed to Francis by Rome Correspondent, Christopher Lamb, onboard “Shepherd One” the nickname for the Alitalia aircraft carrying the Pope. 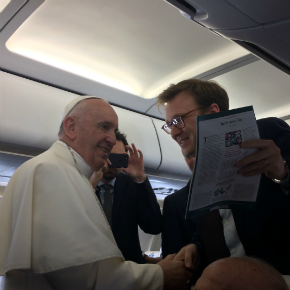 He was given a copy as he walked through economy class to personally greet each journalist travelling to Egypt with him, something he does on every papal flight soon after take off. The Pope burst out laughing replying: “sei cattivo!” meaning “you’re wicked”. Francis was travelling to Egypt as the Order of Malta were gathering to elect Fra’ Giacomo dalla Torre as their new leader following the resignation of Englishman, Fra’ Matthew Festing as Grand Master. Festing resigned after a public battle with the Vatican and travelled to Rome to vote for his successor despite the Pope wanting him to stay away. The latest edition of The Tablet should interest Francis given it contained a number of articles about the trip to Egypt such as an analysis of violence within and a profile of Al-Azhar, Cairo’s famous mosque and university. Inside the Vatican, The Tablet is a respected English-language Catholic media outlet and counts at least one former Pope as a reader and another as a contributor. In 1991, Cardinal Joseph Ratzinger, later Pope Benedict XVI, wrote to then editor John Wilkins to correct two articles he felt had misrepresented his position: one on papal primacy and the other on communion for divorced and remarried Catholics. And in 1964 another editor, Douglas Woodruff, published a piece written by the newly-elected Pope Paul VI defending Pius XII’s wartime record.